Every woman loves a stone-studded pendant shining brightly and fierily on her neck. Though tinier when compared to many other trinkets, pendants with sparkling stones have a charm few other ornaments can match. While the type, colour, and size of these stone do play a role in making a pendant eye-catchy, the most important factor contributing to a stone’s fire and brilliance is its cut. From the most commonly used round and oval to the most expensive radiant and asscher designers use many different cuts to make exquisite pendants. The trillion cut, also known by other names such as the trilliant, trillian, and trielle, is several cuts above many ordinary cuts. Not only are trillion cut stones beautiful but they also are unique and rare compared to their round and oval counterparts. For women who want to sport the fire and brilliance of the trillion cut, here is an exquisite range of trillion pendants from BlueStone, India’s leading online jeweller. Trillion pendant designs offered by BlueStone, as the name suggests, feature one or more trillion cut gemstones. The defining feature of this cut is the triangular shape it lends to diamonds or gemstones. The original trillion cut was first introduced in Amsterdam by the Asscher Brothers (yes, the same company that developed asscher cut diamonds) during the early twentieth century. The modern trillion cut as we see it today was developed and patented by the New York based Henry Meyer Diamond Company in 1962. As the patent lapsed and time passed, the term trilliant was used to refer to any triangular brilliant cut. Believe it or not, in olden days, trilliant gemstones were used not as central stones, but as complementary accent stone. Due to this side-stone status, trilliant stones rarely captured the attention of gemstone lovers for a long time until recently when designers started using them as the main stone on rings, pendants, etc. Naturally, the trillion cut made a remarkable comeback in jewellery and started taking the centre stage for the right reasons. 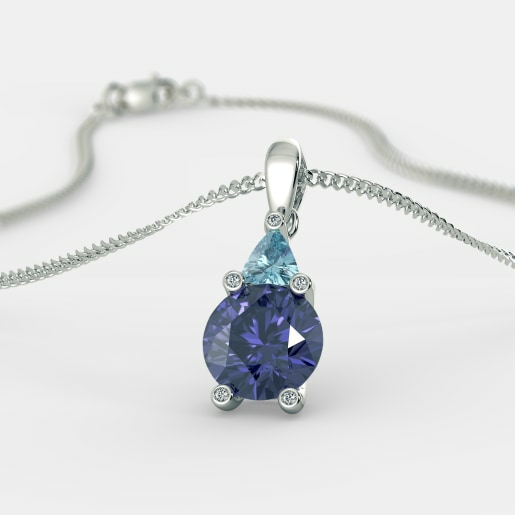 Why Should You Buy Trillion Pendants Online from BlueStone? The reasons are many. To Begin with, triangle-shaped cut also makes a stone looks larger than it actually is. Take, for instance, Quentao Pendant. This 18kt gold pendant features a trillion-cut blue topaz. Contrary to the conventional patterns where trilliant stones are used as accent stones to complement diamonds, this design uses diamonds to complement the central trillion-cut stone. What’s more? The blue topaz in this pendant looks larger than a round or oval stone of the same weight. Secondly, trillion pendants add a breeze of freshness to your jewellery box which is overwhelmingly dominated by round, oval, or pear-shaped stones. The Aristocratic Pendant in our collection is a fine case in point. 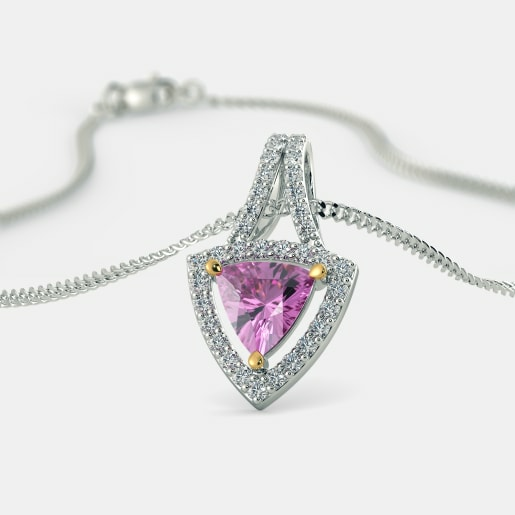 Made of 18kt white gold, it features a trillion cut pink tourmaline and is accented with 35 sparkling diamonds. In its cut and design, this pendant might not be as common or popular as a round or pear pendant. But what it lacks in popularity, it makes up for in freshness and charm. Similarly, trillions are best known for their geometric appeal. The neat and clean geometric accent of these stones makes a pendant look classic and modern at the same time. More importantly, the balanced shape of trillions keeps them in good stead when they are used as the focal piece in a pendant. Take a look at our Royce Pendant and you will know what we mean. 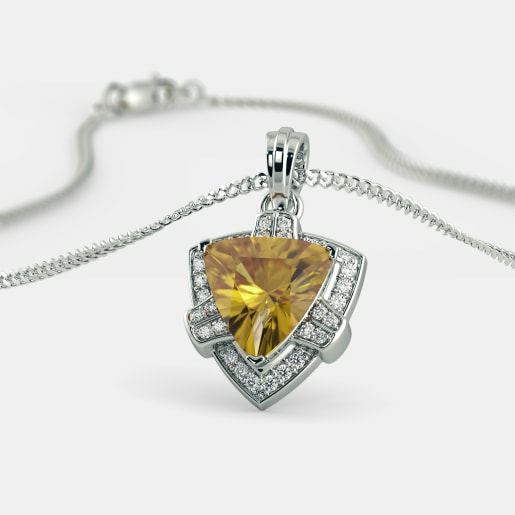 This 18kt white gold design has a triangle-shaped citrine, which gives this piece a unique geometric accent. Even though it is surrounded by 30 twinkling diamonds, the central citrine grabs your attention as the focal piece. This essential classic is an ideal pick for cocktail parties and you are sure to turn a few heads when you sport in with the right outfit and accessories. When you buy trillion pendant designs from BlueStone, you are opting for patterns that come with a high dose of charm and appeal. Unlike the three designs mentioned above, the Paloma Pendant doesn’t have a central trilliant. The central stone here is a large, round cut iolite which is accented by a smaller, triangle-shaped blue topaz. The deep blue of the iolite and the pale blue of the topaz come together to create an azure beauty fit for parties and cocktail rights. The Urban Charm Pendant made of white gold is a one-of-a-kind pendant featuring two trillion-cut stones – an amethyst and an aquamarine. This bestseller in our fashion pendant collection also comes studded with a brightly shining diamond in the centre. These uniquely handcrafted pendants in our collection don’t create a dent in your pocket. Our trillion pendant price is affordable and highly competitive, so you don’t have to think twice before you make the purchase. If you are so used to round and oval pendants, you are likely to feel unsure about how they will look on you. Don’t worry; choose the designs you like, opt for our home try-on option, and try them on before you make up your mind. What more could you ask for?